Technical conference of the international Federation of football Association (FIFA), at which the main coaches of the national teams in Europe will sum up the results of the 2014 world Cup will be held in St. Petersburg on 16 and 17 September. 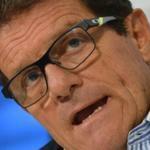 From the national team of Russia will be the team Manager Fabio Capello. Forums leading football coaches are held every 2 years after the world and European Championships.